YOUR SONG (AUS) (Brown 2009-Stud 2013). 3 wins-2 at 2-to 1400m, A$447,180, BRC BTC Cup, Gr.1, 2d ATC Run to the Rose H., Gr.3, 3d ATC Roman Consul S., Gr.2. Half-brother to the dam of SP Wimbledon. Related to SW Fantastic Light (Breeders’ Cup Turf, Gr.1), SW Tarquin, etc. Sire of 34 rnrs, 14 wnrs, inc. SW Split Lip (SAJC Dequetteville S., L), SP Memento, Peristrophe, Soundcheck and of Bold Kingston, Tabbing, Brave Song, Devolving, Envy of All, Miss Exfactor, Setoga, Songlike, Jolie Rose, Girl in a Million, etc. His oldest progeny are 3YOs. MR UNFORGETTABLE (g. by Rubiton). 7 wins to 1500m, A$500,010, STC Winter S., L, Kraft Foods H., AJC Lactate Pro H., International Passport H., Convention Centre H., ATC Bungalow 8 H., GCTC Queensland Events Magic Millions P., 2d BTC Classic, Gr.3, Hawkesbury RC NCP Printing Sweepstakes H., STC Matrium Financial Services Winter Championship H., Gaypak Mandarins 2YO H., 3d Scone Cup, L, STC Winter S., L, AJC Blackwoods H., ATC Blackwoods New Catalogue H., GCTC Magic Millions Cup, STC De Bortoli Wines 2YO H.
What a Poet (c. by Dylan Thomas). 3 wins from 1400m to 1800m, R192,000, to 2016-17, 3d Scottsville Back 2 Pack Packaging H.
Cara Donna (f. by Snippetson). 5 wins-1 at 2-to 1450m in Aust. Liamena (f. by Not a Single Doubt). 2 wins-1 at 2-at 1000m, 1100m in Aust. Miss Gracious (f. by Hard Spun). 2 wins at 1000m, 1250m in Aust. Charmarama (g. by Choisir). Winner at 1600m in Aust. Donostia Star (f. by Denman). Placed at 3 in 2016-17 in Aust. TALLOW (Street Cry). 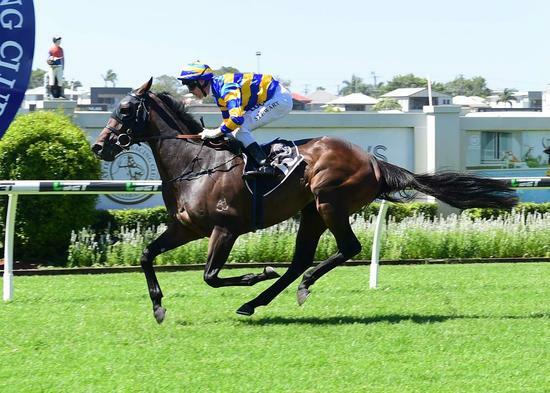 3 wins at 1100m, 1400m, A$365,530, VRC Vanity S., Gr.3, AJC Inglis 3YO Bonus H., Forbes H., 2d GCTC Magic Millions 3YO Trophy, L, 3d AJC Keith Mackay H., L, Magic Millions Wyong 3YO S., AJC Vale Jack Schell 2YO H., 4th Moonee Valley Fillies Classic, Gr.2.